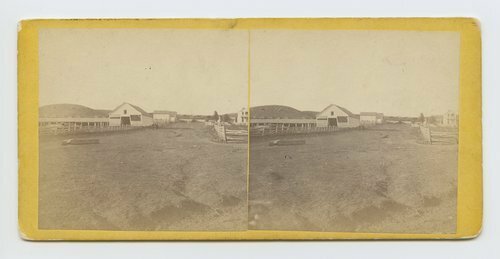 This stereograph shows Moore's Summit, Leavenworth County, Kansas. The photograph shows a farmhouse and barns. It is from Alexander Gardner's series, Across the Continent on the Union Pacific Railway, Eastern Division. Moore's Summit, Kansas, on branch road between Lawrence & Leavenworth. 309 miles west of St. Louis, Mo.